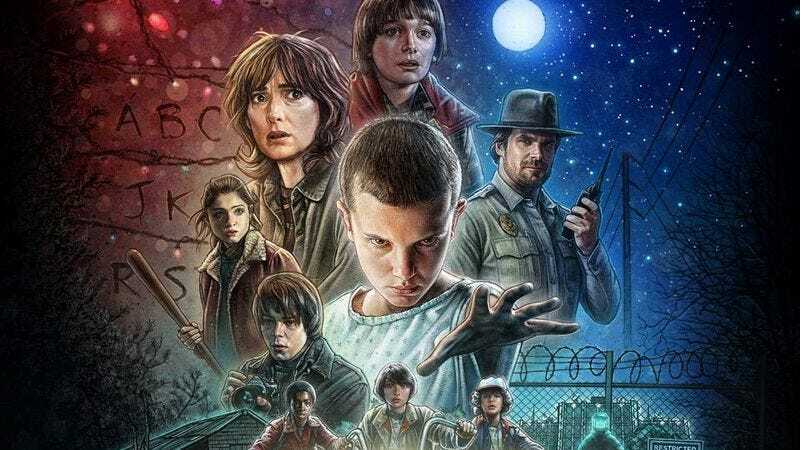 As Stranger Things starts to fade into the warm background radiation of the summer—developing the same nostalgic nimbus that surrounds all the Steven Spielberg and John Carpenter movies it references and apes—some little touches of the Netflix hit still stand out in the viewer’s mind. The sight of Eleven in her bizarre water-tank diving bell, for instance, or a harried Winona Ryder cackling, half-insane, as she clutches a string of Christmas lights to her chest. And especially the music—a mixture of period-perfect ’80s tunes and Carpenter-esque synths from Kyle Dixon and Michael Stein of the Austin-based electronic group Survive. Now you can keep the show’s soundtrack with you as you go about your day—at least half of it, anyway. Lakeshore Records has announced that the first part of Stranger Things—An Original Netflix Series Soundtrack will be out digitally this Friday, August 12, followed by a CD release on September 16. But avid fans of the show’s music should know that they’ll only be getting Dixon and Stein’s excellent score with their purchase, and none of the licensed music that helped ground Stranger Things in 1980s Indiana. To be fair, there are plenty—but also, paradoxically, never enough—places to hear “Africa” online right now. And it feels practically ungrateful to quibble over a release that does feature so much good, moody music. But it’s still a little disappointing that we’re only getting half of the show’s well-calculated musical equation.